The Mighty Thor is virtually synonymous with his thundering warhammer, Mjolnir. It is, after all, the weapon that bestows the power of the Norse God of Thunder to those who are worthy enough to lift it, including the ability to control lightning and storms, or just bash frost giants upside the head. 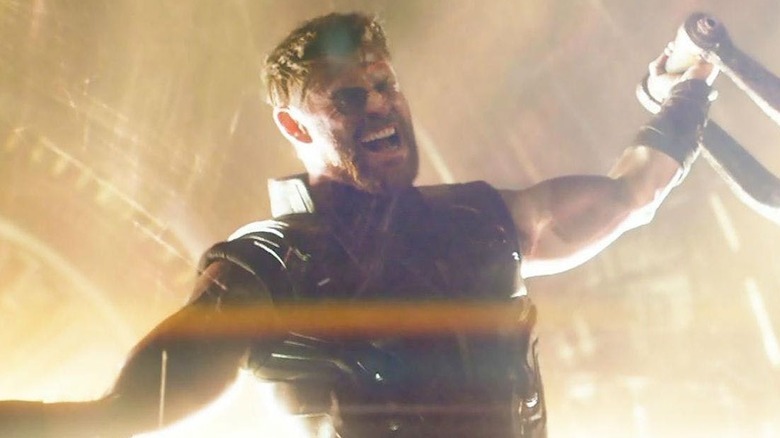 Unfortunately for the Odinson of the Marvel Cinematic Universe, though, Mjolnir didn't make it out of Thor: Ragnarok intact, instead being shattered in a battle against Hela. There's good news, though. If you've already seen Avengers: Infinity War (or just taken a trip down the toy aisle), then you already know that Thor has gotten his godly hands on a brand new hammer: Stormbreaker. 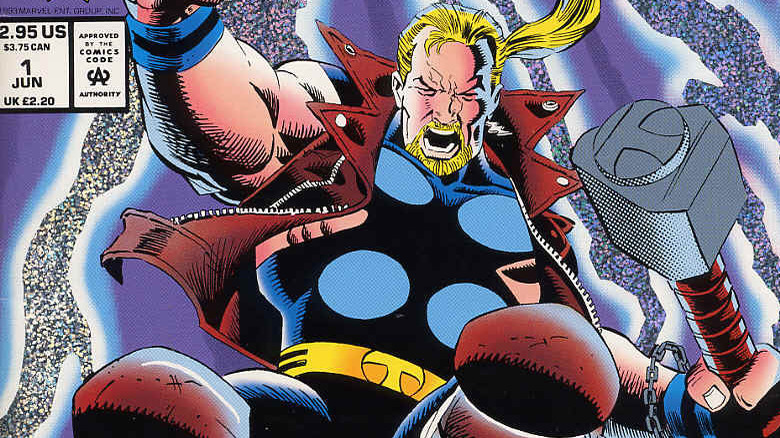 What you might not know, however, is that it's hardly the only other weapon Thor has wielded over the centuries, and Stormbreaker has a unique comic book history all its own. From the mythological roots of Thor's arsenal to the cosmic origin of Stormbreaker itself, here's the truth behind Thor's new hammer, but be warned there are : Infinity War spoilers below! Norse mythology is full of magical weaponry, from Gungnir, the spear of Odin that was enchanted to never miss its target, to the cursed sword Tyrfing, which took a life every single time it was drawn. With that being the case, it's probably not surprising that Stormbreaker isn't the only other tool wielded by the God of Thunder. Thor rolled into battle strapped with more magical weapons than anyone — including Tyr, the god of war. Mjolnir, the hammer so powerful that its blows created the sound of thunder whenever it struck an enemy, is the big one. If you're only familiar with it from the comics and movies, though, it might surprise you that the whole thing about worthiness was never actually a part of the original myths. Instead, Thor was the only one who could heft the hammer simply because it was really, really heavy. So heavy, in fact, that he required two other pieces of equipment: the Megingjörð, a "power belt" that doubled Thor's already considerable strength, and the Járngreipr, or "iron grippers," a set of gloves that allowed him to control Mjolnir despite its heavy weight and unbalanced handle. Oh, and in case that wasn't enough, Thor also had a magic spear named Gríðarvölr that he used to kill a giant named Geirrodr when Geirrodr was convinced to kill him. It will not surprise you to learn that Loki was the one behind that particular plot. It's worth noting that while it hasn't gotten any screen time, the Megingjörð actually does exist in the Marvel Cinematic Universe, and it turned up in the most unlikely place. When Happy Hogan is clearing out Avengers Tower, he mentions it as one of the items that's boxed up for transport on the plane that the Vulture intends to rob. Unlike Mjolnir, Stormbreaker doesn't have its origins in classic mythology. Instead, it's pure Marvel Comics, created by the legendary Walt Simonson in 1984. In the comics, it's also not Thor's hammer. It belongs to another character, Beta Ray Bill. 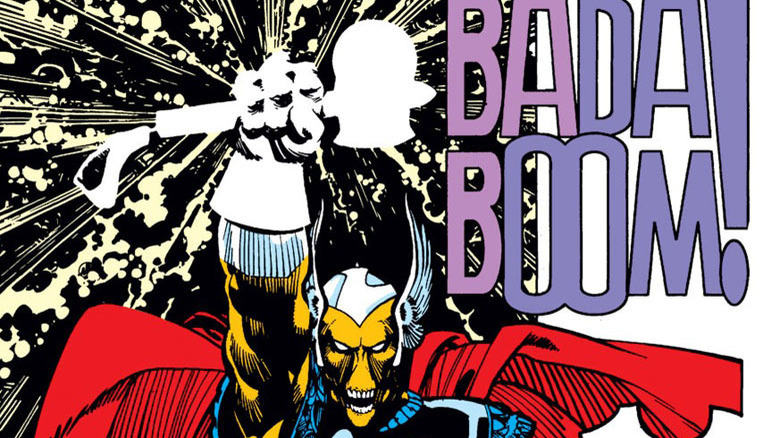 When Simonson arrived on the book in 1983, the first thing he did — aside from literally smashing the book's old logo so it could be replaced with a better one — was tell a story about what would happen if someone else was worthy enough to heft Thor's hammer. That someone was Beta Ray Bill, a super-powered alien who was chosen to defend his people as they traveled through space as refugees after the destruction of their home planet. 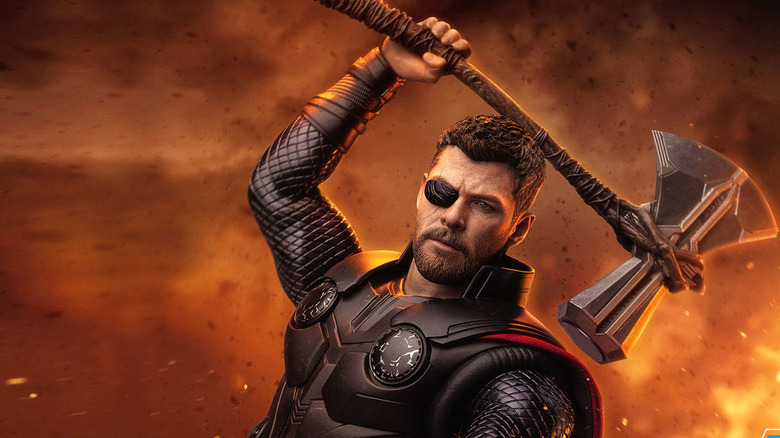 He fought Thor to a stalemate due to a misunderstanding, but his noble heart allowed him to lift the hammer and take the power himself, briefly leaving Thor trapped in the human form of Don Blake. Once Odin found out that someone else had taken his son's power, his response was… well, probably not the best example of parenting you're likely to find in comics. Rather than returning Mjolnir to Thor, he demanded that Thor and Bill fight each other to the death in the fiery realm of Skartheim — and Bill won that one, too. While Beta Ray Bill won the fight to determine who would wield the power of Thor, he also decided that fighting to the death wasn't something he was particularly into. Instead of leaving Thor to die in Skartheim, where the volcanic landscape put the Thunder God at a disadvantage, Bill rescued him and brought him back to Asgard. And that, of course, was Odin's plan all along — by giving Bill the advantage, he was testing not his physical strength, but the nobility that would make him worthy of the great power he was offered. Rather than giving Mjolnir to Bill, Odin returned the hammer to Thor, and then requested Eitri and the dwarves of the underground realm of Nidavellir to craft a second hammer: Stormbreaker. It had a different shape, with a rounded hammer head and an axe blade, but it was forged from the same Uru metal and invested with the Odinpower. It also gave Bill all of Thor's powers, including the enchantment that would transform him from his superhuman but horse-like appearance into the far more humanoid form he'd originally had before he volunteered to defend his people. With that, Thor and Bill became "oath brothers" and friends, with Bill fighting alongside Thor in most of his appearances. While he hasn't really appeared in person, we do known that Bill (or at least someone who looks an awful lot like him) actually has appeared in the MCU. In Ragnarok, you can briefly spot a sculpture of Bill's head at the Grandmaster's gladiatorial arena. He's presumably a former champion, since he's represented alongside the Hulk and, in a truly weird move, a villain with two faces called the Bi-Beast. Blood and souls for Stormbringer! 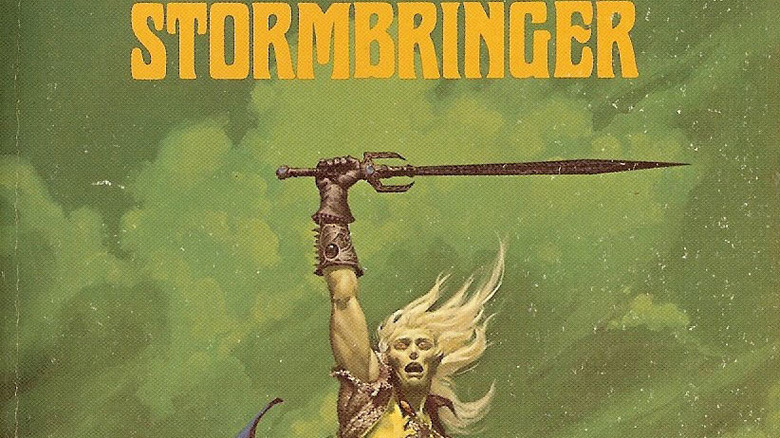 "Stormbreaker" is a pretty badass name, but if you were wondering where Simonson came up with it, there's one pretty likely influence: Stormbringer, the magic sword carried by the title character of Michael Moorcock's Elric novels. In those, Elric was the frail, albino heir to the decadent and generally horrible empire of Melniboné, and his sword wasn't actually a sword at all. Instead, Stormbringer was a demon who had the form of a blade, giving Elric strength and immortality in return for him using it to reap "blood and souls for Arioch," his sinister patron diety. Not exactly a hammer for a noble space horse, but still: a pretty great name. Moorcock's work was extremely influential on comics (along with sci-fi and fantasy novels), particularly in the '70s. In fact, years before Simonson would take over writing and drawing Thor, Elric and Stormbringer had appeared in Marvel comics, teaming up with another fantasy icon in Conan the Barbarian #14 and 15. From then on, he was an off-and-on presence in comics, including a 2007 origin story called Making of a Sorcerer, illustrated by Walt Simonson. Beyond Stormbreaker, there are a couple of other Asgardian weapons of note in the Marvel Universe. The most prominent is probably Thunderstrike's mace, Thunderstrike, and yes: the dude and the weapon both have the same name. It turns out Eric Masterson is not an exceptionally creative superhero. But you don't really need to be that creative when you're Thor, since "hit bad guy with hammer" is a pretty straightforward process. Masterson was an architect who worked alongside Thor in his Clark Kent-esque secret identity of Sigurd Jarlson (he seriously just put his hair up in a ponytail and put on glasses) only to be bonded with the Thunder God. He held the identity of Thor for two years — including during the original Infinity Gauntlet storyline — and when he was finally separated from Thor's godly persona, he decided to stick with being a superhero. To that end, Thor gave Eric an enchanted mace called Thunderstrike, and Masterson took the mace's name for his own superheroic identity. Thunderstrike (the mace) functioned pretty much exactly like Mjolnir, but with one major difference: its inscription reads "The World Still Needs Heroes." Drop that one on your opponents next time you get into some Marvel Comics trivia. Aside from Mjolnir, Stormbreaker, and Thunderstrike, there are a few other Asgardian weapons of note floating around the Marvel Universe — or at least weapons that have been enchanted with Asgardian magic, like the Wrecking Crew's cache of magical construction equipment. Thanks to Loki, who's always looking for new ways to mess with his brother, this gang of villains got their hands on stuff like an enchanted Asgardian crowbar. Here's hoping the MCU goes on long enough that we eventually get Chris Hemsworth swinging one of those around. Loki is also responsible for Stormcaster, a hammer that he once gave to Storm of the X-Men in yet another attempt to cause trouble for Thor. Considering that Storm can already call down lightning to obliterate whatever she chooses, and that she's already been worshipped as as goddess on Earth, this seems a little excessive. Rather than gild the lily, she gave Stormcaster back to Thor. The Marvel Universe's weirdest hammer, however, has to be the one colloquially known as Frogjolnir. See, Loki — this guy again! — once turned Thor into a frog, and he hung out with some Secret of Nimh-esque frogs in Central Park who were having a war with rats. When he recovered his hammer, Thor struck it on the ground and transformed into… a 6'6" frog with a helmet and a magic hammer. Comics are great. 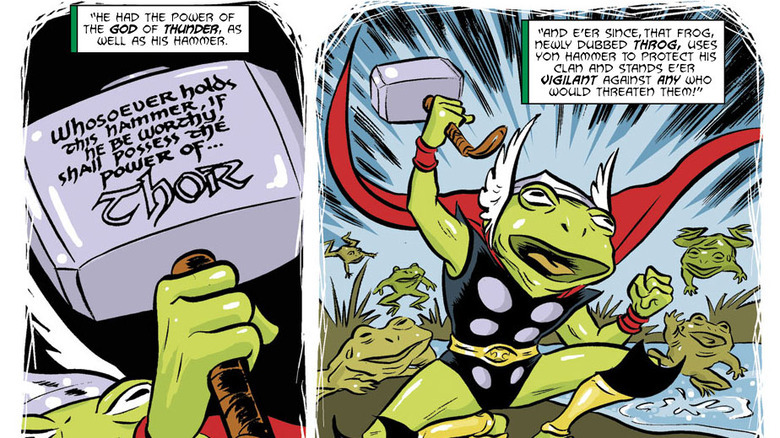 Several years later, one of the frogs, who had also once been human, Puddlegulp, was revealed to have hefted a sliver of uru that broke off of Mjolnir in that story, transforming himself into a toad-sized Thor-frog named, appropriately enough, Throg. 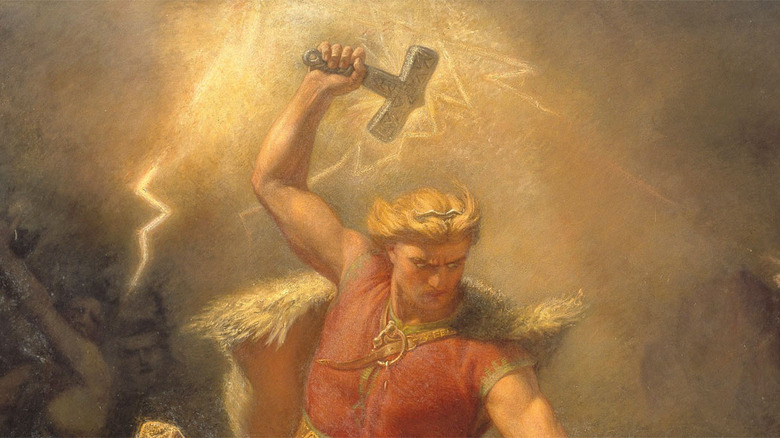 Thor wasn't always worthy enough to lift Mjolnir, and during his years (perhaps even centuries) as a hot-headed, arrogant brawler, he had another weapon of choice when it was time to go bust up some frost giants: an axe named Jarnbjorn. If you recall the iron-gripping Járngreipr, it might not surprise you to learn that the name of this particular axe translates from Norwegian to the awesomely badass "Iron Bear." True to its intimidating name, it's a weapon that's almost as tough as Mjolnir, razor-sharp, indestructible, blessed with Thor's own godly blood to cut through even cosmically powered enemies. And it's a good thing, too. When Thor doubted his own worthiness and found himself unable to heft Mjolnir as a result, the hammer found a new wielder in the form of a new, female Thor. 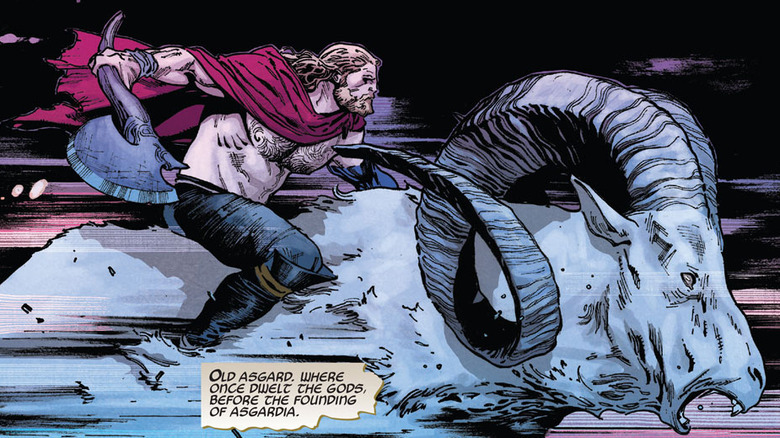 In order to carry on his battle against evil, the Odinson took up Jarnbjorn once again. To a man without a hammer, every problem looks like you could probably solve it with an axe. In terms of visuals, the MCU's version of Stormbreaker doesn't quite resemble Beta Ray Bill's hammer, although it has the same basic double-headed hammer/axe shape. Instead, it bears a striking (get it?) resemblance to the version of Mjolnir carried by the Thor of the Ultimate Universe. If you're not familiar with it, Ultimate Marvel was a publishing imprint that kicked off with an updated Spider-Man in 2000, with the X-Men and the Ultimates — that universe's version of the Avengers — quickly following. The storytelling style was purposefully meant to be more cinematic, but the characters didn't take long to diverge pretty wildly from their core-universe counterparts. Thor, for instance, was initially portrayed as someone who might be a mythical god brought to Earth to battle against evil, and possibly as a delusional but extremely handsome mental patient. Either way, his suit and hammer were technological, not magical… at first. Eventually, his godhood was confirmed, and it was revealed that the techno-Mjolnir he'd carried was designed to look like his memories of his actual godly hammer. 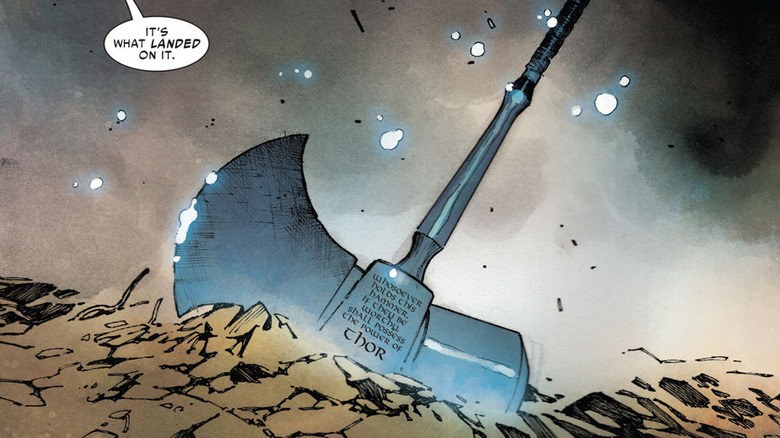 The Ultimate Universe was eventually destroyed, but a few of its elements wound up making their way to the regular Marvel U, including this interdimensional version of Mjolnir. While Thor briefly considered taking it up rather than Jarnbjorn, it actually ended up being hefted by the extremely unlikely, extremely rotund Volstagg the Voluminous, who was transformed into "War Thor." A major plot in Avengers: Infinity War is built around Thor's quest for a new hammer he can use to get his revenge against Thanos. Just like in the comics, he turns to Eitri (Peter Dinklage), although in a big change, Nidavellir is a forge in space orbiting a dying star. That actually is something lifted from the comics, though. 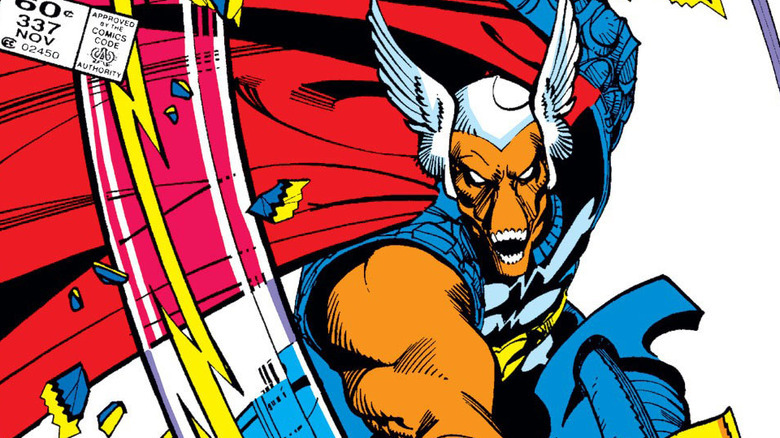 The same issue that introduces Beta Ray Bill also includes a villain using the energy of a dying star to forge a weapon, it's just not Stormbringer. Instead, it's Surtur the Fire Giant forging the gigantic sword called Twilight, which he uses to kick off the battle of Ragnarok. In the movie, Stormbreaker is basically an upgraded version of Mjolnir. It can channel Thor's lightning, returns to his hand after it's thrown, and if the battle against the Black Order and the Chitauri in Wakanda is anything to judge by, it also packs a pretty serious punch. It also gives Thor the ability to control the Bifrost, the rainbow bridge that connects Asgard (and the other realms, including deep space) to Earth. Before the events of Infinity War, this was controlled by Heimdall's sword. There's one more really cool thing about the MCU's Stormbreaker, though. In order to represent the idea of all the disparate parts of the MCU coming together for Infinity War, the hammer is literally built from pieces of the Avengers and the Guardians of the Galaxy. While the heads were forged from uru in Nidavellir, they were joined by a handle that was made from Groot's arm, making for an awesome element to the movie that brought everything together.